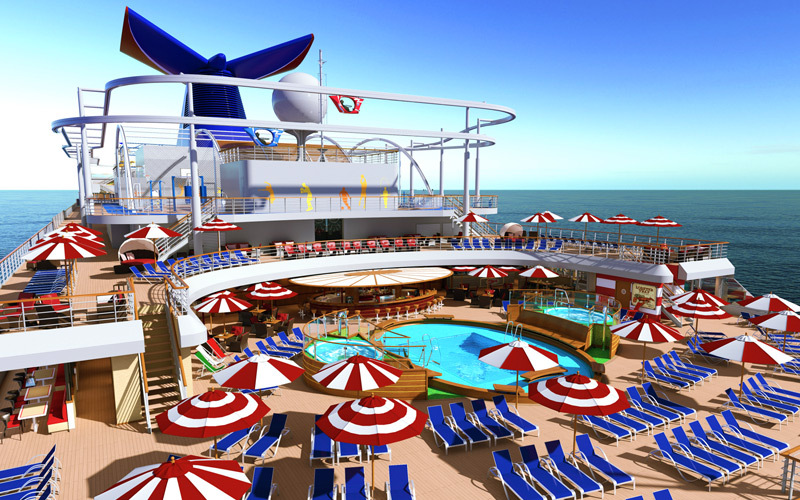 Carnival Horizon, Carnival Cruise Line’s second Vista-class ship, is nothing short of enchanting! 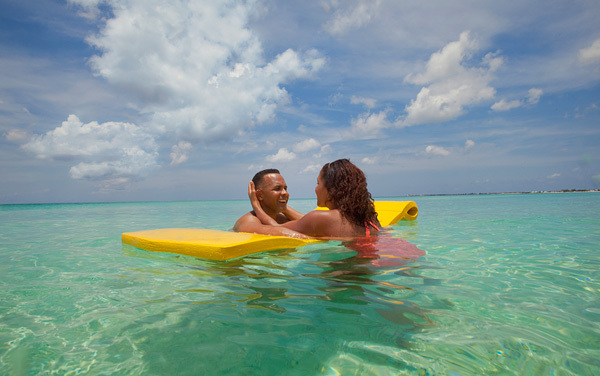 Guests can be sure of a memorable cruise worth a thousand words – with nearly as many options for fun and entertainment onboard! 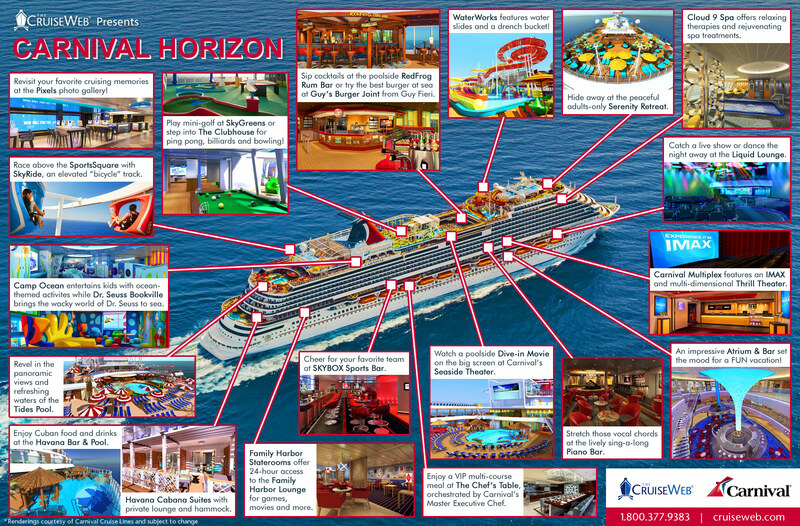 This 133,500 ton vessel has a capacity of 3,936 guests and 1,450 crew members. 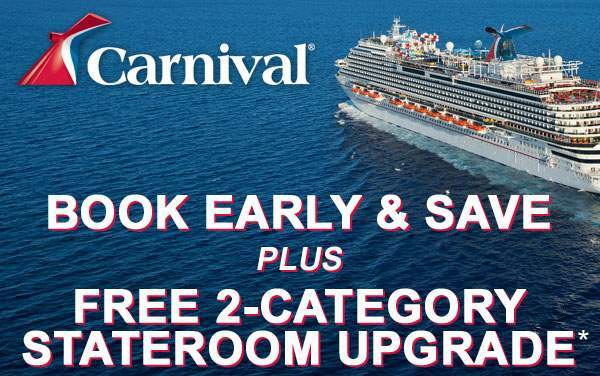 Accommodations will vary from Havana Staterooms and Suites to Family Harbor Staterooms, Cloud 9 Spa Staterooms and many other affordable options. 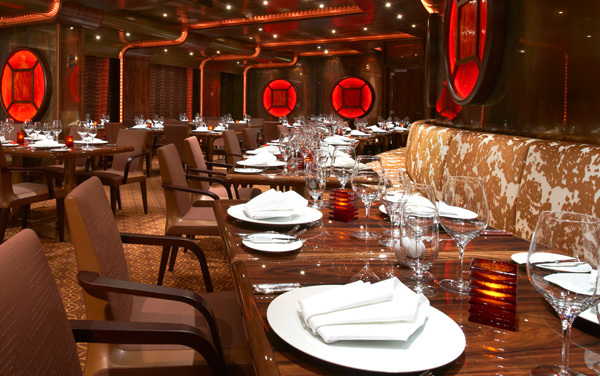 The various dining options onboard Carnival Horizon are an endless array of mouth-watering delicacies presented in irresistible forms. Walk into Seafood Shack for rustic favorites like Crab Cake Sliders, Fahrenheit 555 Steakhouse for your choice of steak cuts, The Chef’s Table for an exclusive meal, and many more. 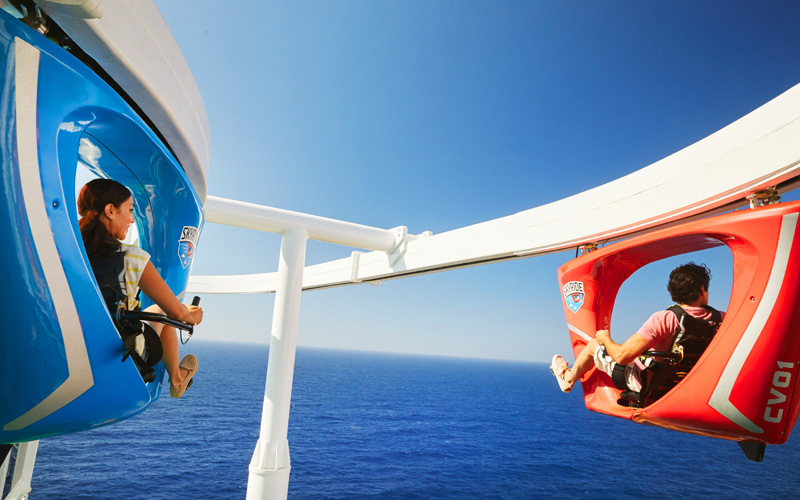 Don’t forget to head over to the Sportsquare for Carnival Horizon’s most popular aerial attraction – the SkyRide. 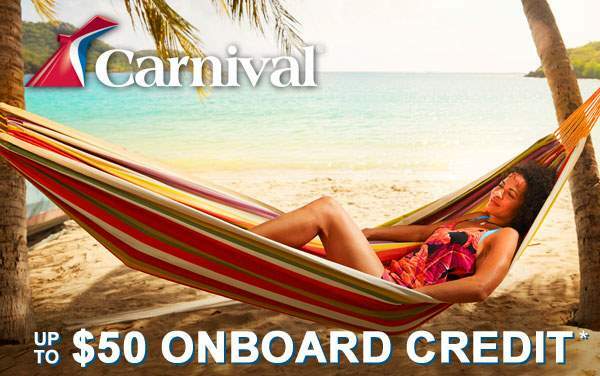 To learn all about the different amenities, dining options and onboard activities on Carnival Horizon – or to discuss her various itineraries – contact The Cruise Web today! 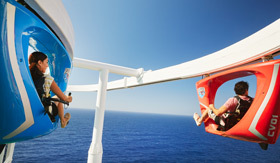 The SkyRide is undeniably Carnival Cruise Line’s most famous open-air amusement ride to date. 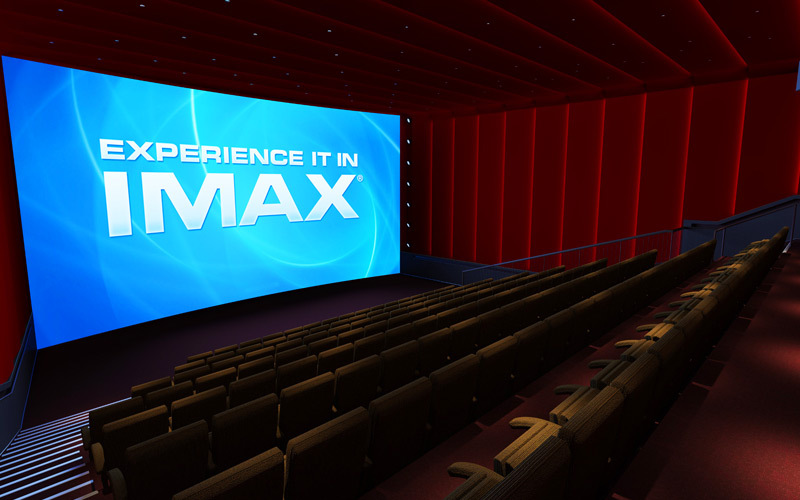 It’s a bit like riding a bike on an 800-foot-long track speeding up to 25 miles per hour – all while high above the deck and even higher above the sparkling blue sea. How’s that for biking?!? It’s an adrenaline pumping thrill you will never forget. Once onboard, this luxurious Latin-infused living space will quickly become your own private island with member-only access to the Havana bar and pool. Enjoy a relaxing day under colorful umbrellas at the whirlpool with a refreshing mojito or Cuban cocktail. All Havana staterooms feature unique décor that do all the talking while ushering you into the tropical islands of the Caribbean. Foodies rejoice! 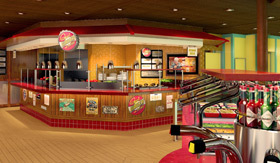 Carnival Horizon will feature more in dining than your belly will have room for. Check out Seafood Shack, Fahrenheit 555 Steakhouse, Bonsai Sushi, The Chef’s Table, Jiji Asian Kitchen, Cucina Del Capitano, BlueIguana Cantina, the famous Guy’s Burger Joint and more! Balcony staterooms were designed for maximum sea breeze and the most stunning views, so look to a balcony if you're looking to cruise aboard Carnival Horizon. Any time you're in your room, you're just steps away from your own personal outdoor oasis, featuring the sort of sea view you can also feel. If your group likes to sail closer to the waves - or just in a calm location at the aft of the ship - choose a Family Harbor Cove Balcony stateroom. You'll find your outpost a wave-watcher's paradise... and while we can't promise, you just might catch a living, swimming marine biology lesson from your railing! This stateroom features a unique nautical decor inspired by the craft of seafaring itself. 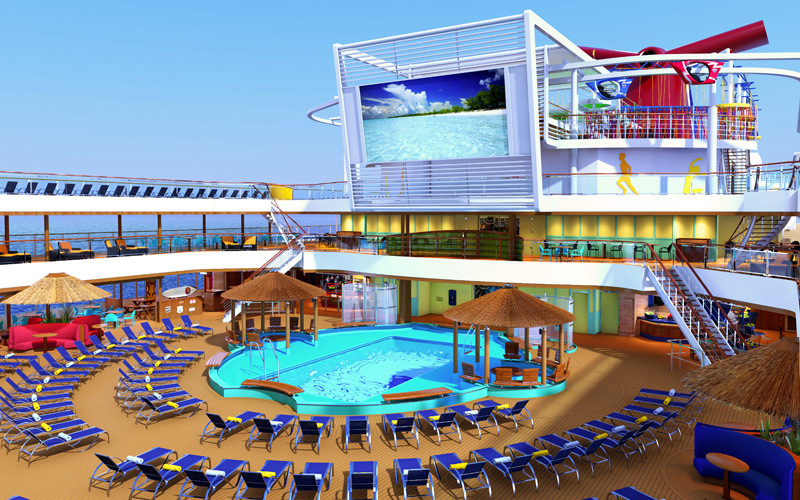 The whole family will enjoy access to the Family Harbor Lounge and perks around the ship. 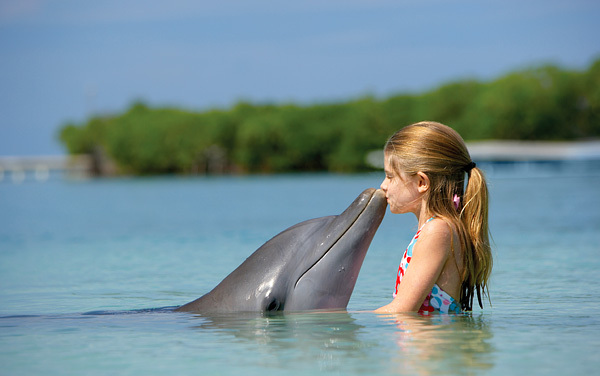 Love the sea? Carnival Horizon Cove Balcony staterooms are the best way to see the sea - these rooms get you close to the waterline, and feature balconies that let you make the most of your location. Enjoy things from a whole new perspective: one amazing up-close view of the wake and sea foam as the ship cruises along. Step into a Premium Balcony stateroom aboard Carnival Horizon and it's easy to see exactly what you're getting: one seriously spacious stateroom. It's about more than just the room itself, you'll find... step onto your oversized balcony and you'll find that when there's a sea breeze in your hair, there's no limit to the relaxation you can have. This special room type features a unique nautical decor, full bathroom, generous amenities and exclusive perks that families love. "Aft-view" means that your room faces backwards - the best way to watch the flow of the ship's gentle wake as we sail along. Oh, and the balcony you'll enjoy it from is bigger than in a standard balcony room! You'll have great choices about how to spend your time: curling up to comfort indoors, stretching out outdoors... or enjoying the nearby Family Harbor Lounge! An Interior stateroom is the most affordable way to cruise, and Carnival Horizon's interiors are not just cozy, but are full of things you'd expect from any Carnival stateroom: a full private bathroom, Carnival Comfort Collection linens and just-a-call-away 24-hour room service. We've taken the warm essence of our Cloud 9 Spas and infused it into spa staterooms on Carnival Horizon. Your room is the perfect place to do less, actually: just relax and take some you-time, anytime. All Cloud 9 Spa accommodations feature private spa access, special amenities and priority spa reservations. With an Interior stateroom you will get a full private bathroom, complimentary 24-hour room service plus linens you can feel at home in all of which make this a great spot for curling up after a long days fun. Carnival Horizon's Porthole staterooms give you the classic seafarer's view times two - a pair of round windows providing an affordable view of the ocean. If you tire of ocean-gazing, there's plenty more to do onboard, but 24-hour room service is one amenity you can enjoy as you continue to take in the view. Catch a glimpse of what's going by from your Ocean View stateroom aboard Carnival Horizon, where you'll get views you won't find anywhere on land. 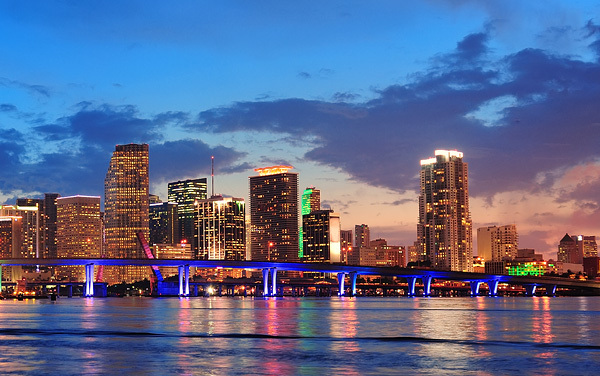 Don't miss sunrise and sunset at sea - your comfy stateroom is the best way to experience these! Let the whole family - especially the little ones - experience the wide-eyed wonder of a room with a view: a Family Harbor Deluxe Ocean View stateroom. Not only are the sky, the sea and the sights beautiful to behold from your window, but Family Harbor staterooms feature a unique nautical decor inspired by the craft of seafaring itself. 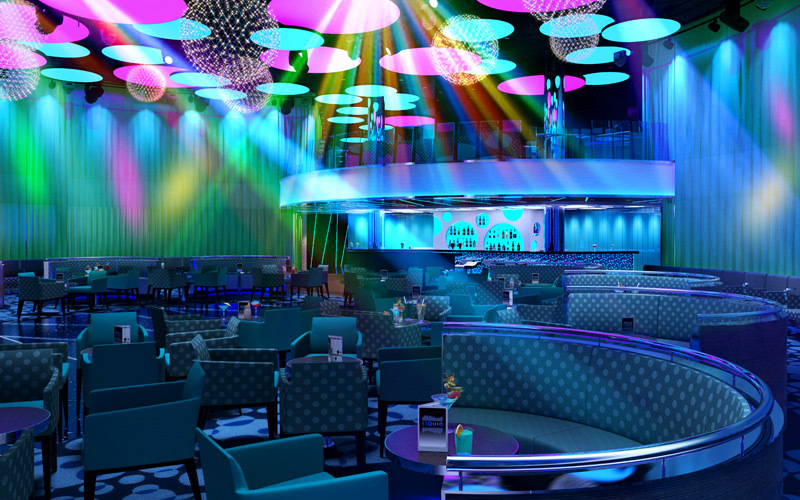 The whole family will enjoy exclusive access to the nearby Family Harbor Lounge and more great perks around the ship. Let the whole family - especially the little ones - experience the wide-eyed wonder of sailing in a room with a view: a Family Harbor Ocean View stateroom. Not only will a vacation with a view like this help cultivate a lifelong love of the ocean, but Family Harbor staterooms feature a unique nautical decor inspired by the craft of seafaring itself. 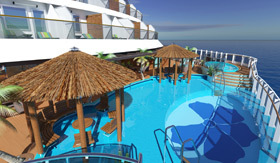 The whole family will enjoy exclusive access to the nearby Family Harbor Lounge, plus more great perks around the ship. On Carnival Horizon, Deluxe Ocean View staterooms are a great choice for families who want to let the sun shine in as they sail. Rooms of this type feature great views, a full bathroom - plus a separate washroom - and while stateroom configurations vary, certain Deluxe Ocean View rooms have space to sleep up to five cruisers. 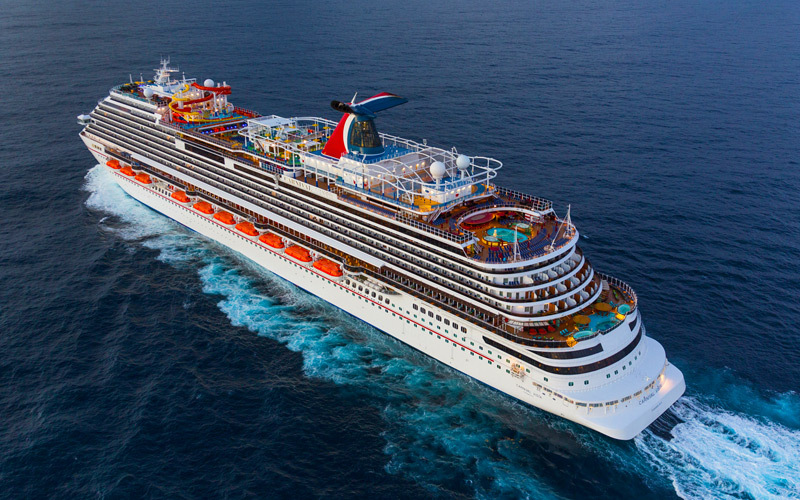 A Carnival Horizon suite is the ultimate way to cruise. With more space for stretching out indoors, plus a large balcony for kicking back outdoors, try an Ocean Suite to experience private, luxurious relaxation. Ocean Suites also include VIP check-in, walk-in closet and bathroom with whirlpool. A Grand Suite aboard Carnival Horizon features even more space than the standard suite - plenty of room in your room! This stateroom is loaded for an unparalleled experience: VIP check-in, a huge balcony, and even a convenient dressing area with vanity. As you step into a Junior Suite aboard Carnival Horizon, you can't help but feel that you're stepping into full-size luxury in a smaller package. 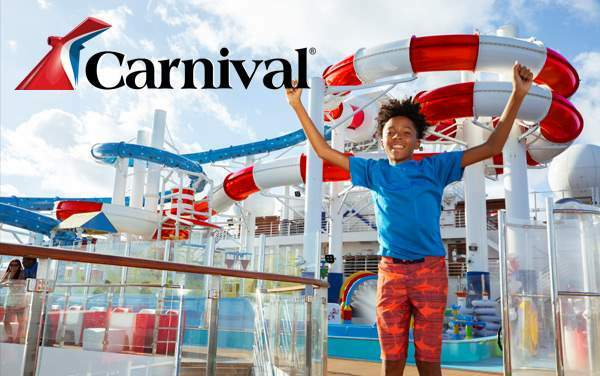 Featuring a standard-size balcony, in a Carnival Horizon Junior Suite you'll find everything else there is to love about a suite, including VIP check-in, a walk-in closet... and even a whirlpool tub for relaxing. 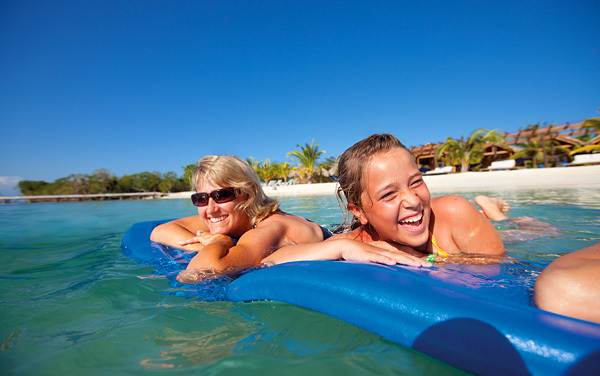 Family life is the sweet life, on land or at sea... especially when in a Family Harbor Suite. Your whole crew will enjoy the stretch-out space, huge balcony and other perks a suite offers, but a nautical decor specially-designed for Family Harbor staterooms. 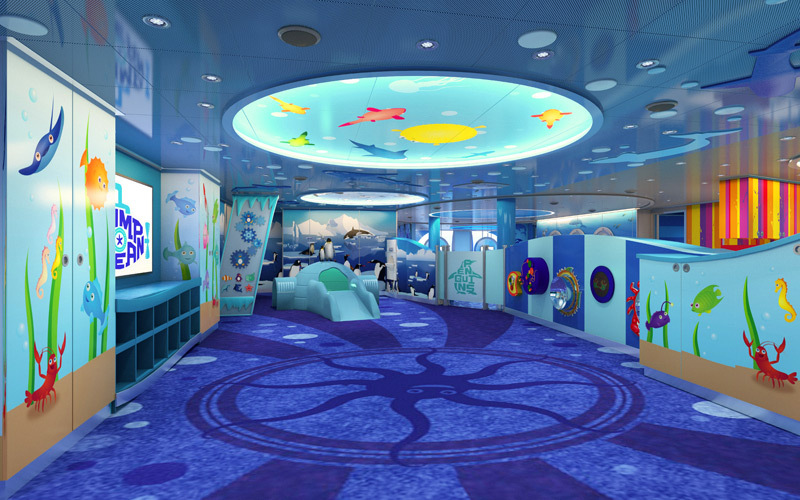 Kids and adults can make use of access to the nearby Family Harbor Lounge, plus other perks around the ship. In-room, there's a full bathroom... plus the convenience of a separate washroom.